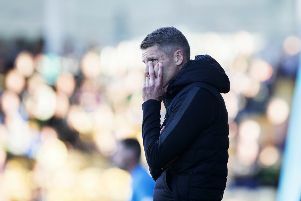 The Cobblers entertain Mansfield at the PTS Academy Stadium on Saturday, and it is a significant day for Town boss Keith Curle as he comes up against the club that gave him his first chance in football management. It is also the club that sacked him in December, 2004, with Curle accused of ‘bullying and intimidating a youth team player’. It was certainly an upsetting and low point in Curle’s footballing career, but it was also complete nonsense. The former Manchester City and England defender always denied all of the accusations, and to prove it he took Mansfield Town and the chairman who sacked him, Keith Haslam, to court to clear his name. And clear his name he did. After a two-day court hearing, Judge Field QC cleared Curle of any wrongdoing, saying he had acted ‘appropriately, professionally and fairly’ at all times, and described Mansfield’s disciplinary process as a ‘sham’. “It was disappointing it went to court, I won my court case, but unfortunately that doesn’t get highlighted as much,” said Curle, who was initially suspended in November, 2004, before being dismissed a month later. “I think there were 18 points of order that went to court, and I won every single one of them. “It is disappointing that you are starting your career and lose your job under accusations, and that you have to take it to court. But it was the right thing for me to do, to clear my name. Despite his complete innocence, what happened to Curle is the sort of thing that can severely damage a career, but he has successfully shrugged it off. He took up the manager’s job at Chester City before his court case win in August, 2006, and has gone on to manage Torquay United, Notts County, Carlisle United and now the Cobblers, as well as being assistant manager to Neil Warnock at Crystal Palace and Queens Park Rangers. Curle is obviously not happy with Haslam and what he did to him, but he has never let it eat away at him. “I still see the previous owner in and around Sheffield, and the conversations are pretty short,” said Curle. “It is one of those where I went to court, I knew I was right, and I knew they were wrong. “To be honest, right from the outset they knew they were wrong, but that is the way football cub owners sometimes work. “They know they are wrong but they go down that path and don’t really care about somebody’s name, and that their reputation is at stake. “I have lost my job before and it’s not nice, but it is one of those things you accept if you have lost your job through not being able to gain enough points, or something else long those lines. “You have to accept that when that happens, but when somebody accuses you of something you know is not right, then you are well within your rights to take it to court and win your case, which is what I did. Although it was a difficult time for Curle, he has never held anything against Mansfield Town as a club, and says he still has ‘fond memories’ of his time at a ‘fantastic football club’. The high point of his time at Field Mill was steering the Stags to the 2004 division three play-off final, controversially seeing off the Cobblers in the semi-final along the way, although they were beaten in the final by Huddersfield Town, losing a penalty shootout. 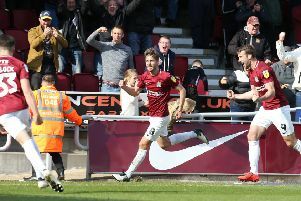 Mansfield are once again knocking on the promotion door this season, and an army of close to 1,500 of their supporters are expected in town this weekend to see their clash with the Cobblers. Curle has nothing but admiration for those supporters, and the club as a whole. “When I was at Mansfield the Stags fans were good supporters, and they were very vocal,” said the Cobblers boss. “It culminated in us having a fantastic day out at the Millennium Stadium, and a great play-off final that had everything, and I very much enjoyed my time at the club. “I was disappointed with how it ended, but I think a lot of the people that know me, knew the football club, know the truth, and that is the important thing for me.